CarPhotoTutorials.com offers you regular updated tutorials and articles on how to achieve the best possible automotive images as seen on calendars and inside magazines, every image you find on these pages will have detailed Exif data listed, so you can learn from our settings and try to shoot in a similar way. From these tutorials you will master the skills it takes to shoot stunning car photos, our team of top automotive photographers has years of experience in just about every field of this niche in photography, and we are willing to give you the secrets behind our amazing photos. We will teach you how to photograph cars at an outdoor event, inside a car show or museum, at the races and during a one on one photo shoot with a magnificent exotic super car. Take a look at the image above, if you wonder how this one was made just click it and you'll be able to read the entire article about this shot. Still deciding on what camera or lens to buy, we give you some interesting insights in the kits we use for our work to make sure you get started on the right foot and don't spend a fortune to begin with. Get an understanding of DOF, perspective, where to put the car in the frame, select your spot to make the best photographs, what time of day would suit you best ... and many other small things you should remember when shooting a car. Ever tried panning shots ? We give you our insight on how to be able to get the lowest possible shutter speed depending on the actual velocity of the car, you'll be making the best action shots at the races with these tips. You've made the photographs ... now what ? Our extensive experience using editing software can set your images really apart, the image isn't finished when it comes out of your camera, the fun is just starting. We will also offer you case studies : we show you a photograph and walk you through it from taking the shot over the post processing up to the point were we feel the image is ready for publication, these studies will help you understand the difference in various car shots. 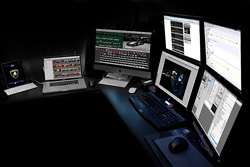 All the above and much more will be detailed in our easy to understand tutorials, updated regularly, CarPhotoTutorials.com will be your source to make automotive photography easy.